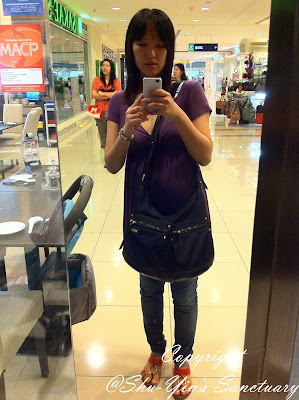 My sis, Shu-Wen bought me this fabulous Storksak Emily Diaper Bag. It's like one of the branded bag around and is a pretty expensive diaper bag. 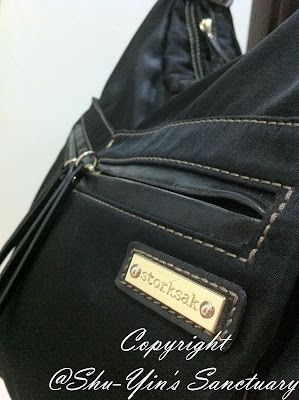 OK, let me tell you why I super duper love this diaper bagbag. First of all, it doesn't scream 'diaper bag'. I hate diaper bags which have cartoons pictures on it, or with bold bright colours. All I wanted is a nice 'adult bag' which is practical and plenty of space for me to keep all my baby stuff. And Storksak Emily just fits the bill! Simply and classy. Need I say more? Secondly, it is lightweight. It barely weighs anything when it is all empty inside and is just the bag. It just doesn't make sense to have a heavy diaper bag because as you all know, we put a gazillion things inside the diaper bags. So imagine carrying a ton of things and also the weight of the bag. This Storksak Emily is lightweight and thus I am happy that the weight I am carrying are all the stuff I've put in and just a little more. Although lightweight, this back is very roomy medium-sized diaper bag. Not too small and not too large. 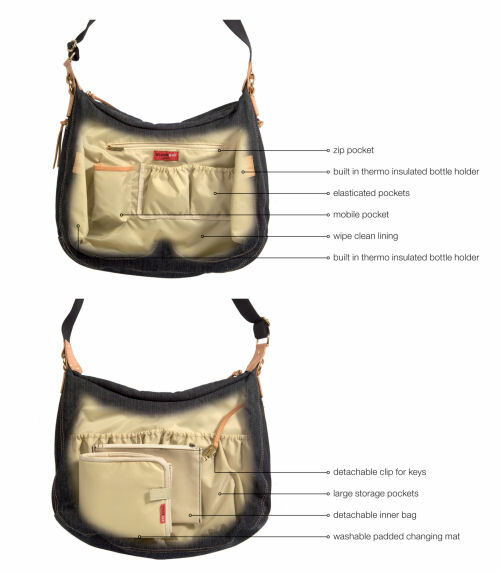 It has plenty of pockets and space for everything. Look at the stuff I put inside the bag. In one of the large pockets, I've got 5 diapers in there, and in the other I've got a change of clothes for Khye, a bib, a pair of booties and mittens, and a hat. In the smaller pocket, Ive for a pack of wipes and I put my Bottom Balm tub and hand sanitizer in the other smaller pocket. And I put my mobile in the mobile pocket. 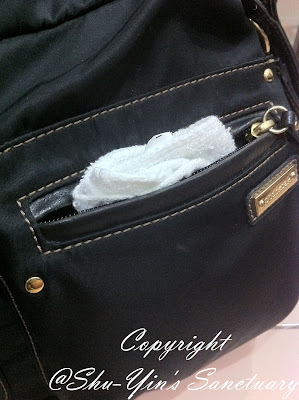 In the zippered pocket, I've got a pacifier in there (though Khye is not using it). And I keep my money and credit cards in the detachable inner bag. 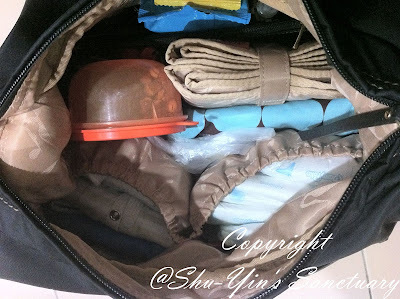 After all these, in between the pockets there are still space for me to put in the padded changing mat, a nursing cover, a recycle bag, a change of clothes for Shern, and also a small Tupperware of snacks for Shern. I wish the changing pad that comes with it is a little less bulky. But if you see it another way, though a little bulky, it is well padded and generously sized at 23 ½ by 14 inches. And my most favourite feature and these 2 built-in thermo insulated bottle holder on each side, hidden yet my bottles are kept insulated. 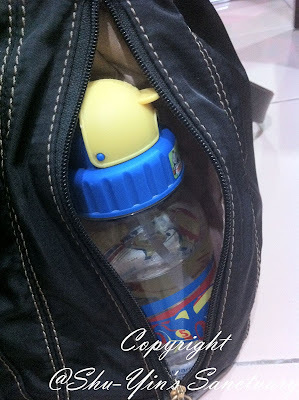 In it I can keep Khye's warm bottle of milk, and also Shern's bottle of water. I can keep one side warm, and the other cold if I like it, coz they are separated. Yay! And on the outside of the bag there are two zippered pockets. I sometimes keep the hanky there as well for easy retrieval. But most of the time I keep my personal stuff here. This is where I keep my mobile and also my car keys. 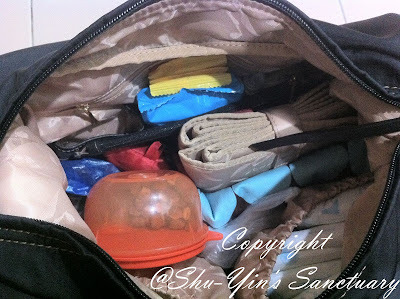 This bag is made with soft nylon fabric inside out and is easy to clean. With this material, water spilled outside will not be soaked in, but will just ran off the side of the bag. I spilled some milk on my bag and was glad to see the milk juz ran off the side of the bag. And it comes with a leather bottom which I love. There was once I put my bag on top of a wet floor which I did not notice. When I noticed it, I quickly took my bag off the floor and was glad that water did not seeped into the bag because of the leather bottom. 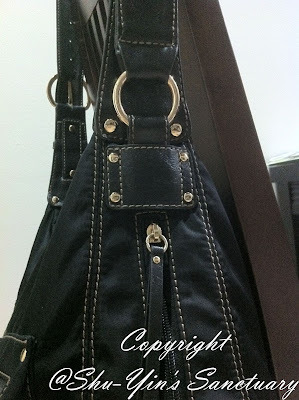 I also like the long adjustable shoulder strap with contrast stitching. And the workmanship is good too. 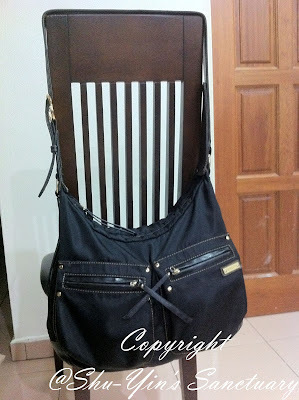 I also like the gold metal buckle and rings that made this bag so simple, yet classy. 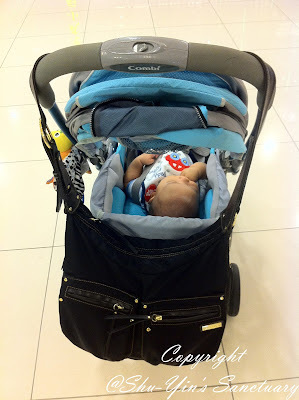 I hand it behind the stroller most of the time if Khye sleeps in it. But I need to remember to take it off when I wanted to wheel the stroller up the escalator, because is is dangerous to balance the weight of the baby in the stroller with an addition of the diaper bag as well. And best of all, I feel that the straps have great weight distribution and didn't hurt my shoulders although heavy. Yes, it is heavy for I put a gazzilion things inside, not to mention water bottles in there as well. But even carrying it around for hours, I do not feel the strain or that it hurt my shoulders. Fantastic. What I like to see improved is that I wish that the zip opening of the bag is a little larger. Sometimes it can be difficult to get what you need when you are in a hurry. And then of course I wish this bag is not so expensive. 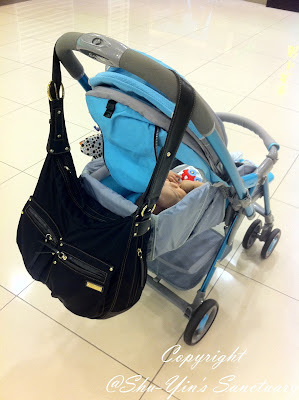 In Malaysia, it is selling for about ~RM500, which I find is rather expensive for the average mums. 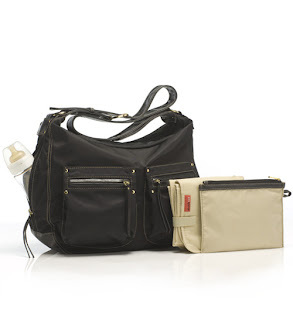 But on the other hand, the Allerhand diaper bags are also in the same price range. ***Please take note that this post is NOT sponsored. I received this bag as a gift from my sister. All text and opinions are of my own and represents my honest opinion of the product(s).